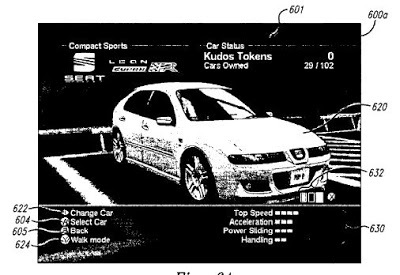 The ‘220 patent describes a racing game where players enter a showroom filled with cars from which he can select one to race. The invention also lets the player take a test drive of a car before he commits to that car. The cars in the showroom are grouped by manufacturer to help a player locate a care more easily. By showcasing the cars in a garage and allowing the user to test drive the car before committing, the invention allows the user to select a car which matches his driving style closely and thus makes the game more enjoyable for the user. Racing games and other computer-implemented games having garage, showroom and test drive features are disclosed herein. In one embodiment, a method for implementing a racing game in accordance with one embodiment of the invention includes displaying a plurality of cars in a simulated showroom setting. Game players can roam freely about the showroom in first-person mode and inspect the cars in close detail. If a player desires, he or she can test drive one or more of the cars to assess its performance before competing in a racing event with the car. 1. A computer-implemented method for selecting a car in a racing game, the racing game including a race portion, the method comprising: viewing a plurality of different cars in a showroom setting, wherein the plurality of different cars may be viewed simultaneously; selecting a first car of the plurality of different cars for a test drive, wherein the first car has not been purchased, and wherein the first car may not be used to race until it has been purchased; test driving the first car; and competing in the race portion of the racing game with at least one of the first car or a second car of the plurality of different cars. Receive email alerts for new posts. The information on this site is provided for informative and educational use only and should not be relied on as legal advice. No attorney-client relationship exists by virtue of you reading our blog. Always consult an attorney if you need specific legal guidance.